Garmin's Car GPS devices are outstanding. I've one with me and I always wondered if there were phone capability on it's GPS devices. 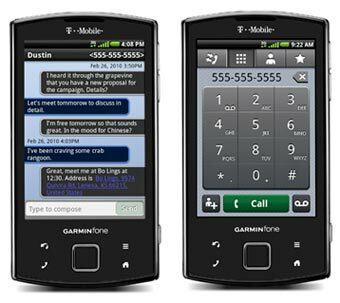 And here we have Garminfone Android Phone. 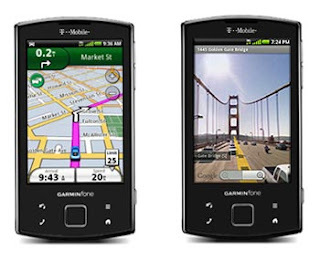 The first Android-powered smartphone fully-integrated with Garmin's premium GPS software, the 3G-enabled Garminfone smartphone gives you the same navigation experience found on Garmin's standalone GPS devices--including voice-guided and on-screen directions, real-time traffic, weather, and gas prices. The mobile Web browser includes enhanced functions, including pinch and zoom capability and embedded location awareness that links information found on the Web to navigation and mapping functions--enabling you to navigate directly to a location from a Web page. The Garminfone is ready to go with the included car kit--simply plug it in and snap it in the car mount and you'll be on your way in no time. Garminfone also features a bright 3.5-inch display, and a 3.0-megapixel camera with geotagging capabilities so you can share location details about the places around you. The Garminfone provides easy access to both personal and corporate e-mail, calendars, and contacts supported by Exchange Server and Gmail. 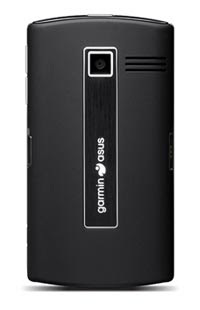 Other features include 4 GB of internal memory, microSD memory expansion (with 2 GB card included), Wi-Fi networking (802.11b/g), Bluetooth for hands-free devices and stereo music streaming, multi-format digital media player, and up to 4 hours of talk time. It's built-in GPS software is what set it apart from the rest. Why worry to pay another over $100 for extra GPS map/software?? If you're planning to get one, at the moment, you've go with T-Mobile's plan.